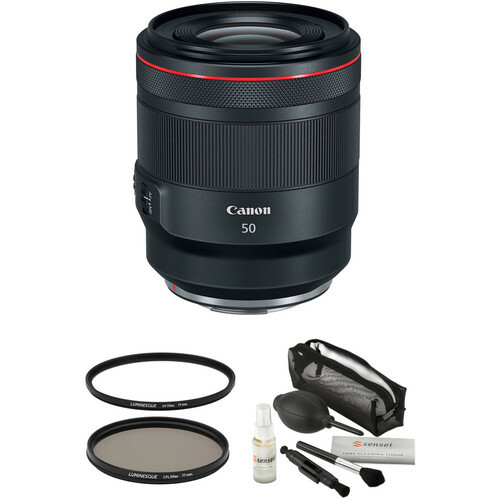 Complementing the lens itself, the Canon RF 50mm f/1.2L USM Lens with Filters Kit from B&H bundles the normal-length prime with 77mm UV and circular polarizer filters. Distinguished by its speed, the RF 50mm f/1.2L USM from Canon is a desirable normal-length prime due to its versatile focal length and bright f/1.2 maximum aperture. This fast design excels in difficult lighting conditions and also benefits working with shallow depth of field and selective focus techniques. The optical layout incorporates one UD element and one aspherical element, which help to reduce both chromatic and spherical aberrations in order to produce greater clarity and sharpness. A rounded 10-blade diaphragm also benefits bokeh quality to suit isolating subjects with depth of field. Complementing the imaging capabilities is an apt ring-type Ultrasonic Motor, which delivers fast, near-silent autofocus and full-time manual focus override. Additionally, a unique Control Ring is integrated into the lens design for intuitive control over exposure settings from the lens itself. Normal-length prime is designed for full-frame Canon RF-mount mirrorless digital cameras. Exceptionally bright f/1.2 maximum aperture affords extensive control over depth of field for selective focus applications and also benefits working in low-light situations. One UD (Ultra-Low Dispersion) element is featured, and helps to minimize chromatic aberrations and color fringing in order to provide greater clarity and color accuracy. An aspherical element is used to correct spherical aberrations and distortion for improved sharpness and accurate rendering. Ring-type Ultrasonic Motor (USM), along with optimized focusing algorithms and a high-speed CPU, is employed to deliver fast, precise, and quiet autofocus performance as well as full-time manual focus override. Rounded 10-blade diaphragm contributes to a pleasing bokeh quality. Combining two of the most useful filters available, Luminesque's 77mm Circular Polarizer and UV Slim PRO Filter Kit is well-suited to all forms of photography. Both filters are constructed from Schott optical glass and feature a 12-layer multi-coating for maintained clarity and image quality. Each filter is also set in an anodized aluminum filter ring, with the UV filter featuring a slim 3.4mm-thick profile to lessen the likelihood of vignetting with wide-angle lenses. The UV filter is a general use, clear filter that helps to absorb ultraviolet light and reduce the bluish cast of daylight. It is also useful as a general protective filter to leave on lenses at all times in order to reduce dust and moisture from reaching the front lens element and to provide additional protection in case of accidental impacts. Its 12-layer multi-coating also helps to achieve 98.2% light transmission for faithful color reproduction and contrast. The circular polarizer filter helps to reduce reflections and glare by filtering out light that has become polarized due to reflection from a non-metallic surface. This results in a noticeable increase in the saturation of skies and foliage, as well as clearer imagery when photographing in hazy conditions. A circular polarizer differs from a linear polarizer in that it supports full use of a camera's autofocus and auto exposure functions. Constructed from Schott optical glass for maintained image quality and clarity. A 12-layer multi-coating helps to reduce surface reflections and glare for improved contrast and color neutrality. Anodized aluminum filter rings feature a knurled top edge for easier installation and removal. Absorbs UV light and reduces bluish cast of daylight for greater image clarity. Works as general protection filter to reduce dust, moisture, and scratches from reaching the front lens element. 12-layer multi-coating helps to realize a high light transmission rate of 98.2%. Slim filter ring incorporates front threads and measures 3.4mm-thick to lessen the likelihood of vignetting when used on wide-angle lenses. Reduce reflections and glare by filtering out light that has become polarized due to reflection from a non-metallic surface. Arrange and filter directionally polarized light perpendicularly to the reflected light allowing for the absorption of much of the light. Lessens haze in distant landscapes and provides more saturated, vivid colors. Box Dimensions (LxWxH) 19.3 x 16.8 x 11.7"
Box Dimensions (LxWxH) 4.3 x 4.3 x 1.1"
RF 50mm f/1.2L USM Lens with Filters Kit is rated 4.8 out of 5 by 8. Rated 5 out of 5 by Robert from Amazing Lens - Superb Bokeh So far I am impressed with the RF system and cant wait for this to blossom into what its capable of being. That being said I love this lens. It feels really balanced on the EOS R although some have complained on those silly youtube channels that its heavy; DUH, it is. Anything of quality is. Bokeh is buttery soft which is what youre obviously looking for and image quality is superb. Im not a specs person and base my thoughts on feel and image quality. Rated 5 out of 5 by Thomas from Fantastic Fifty This lens truly is fantastic. Im attaching a couple of un-cropped images shot a f/1.2 (one inside really closeup, one outside for more of a 3/4 portrait with rider and horse). I couldnt see any vignetting or distortion in either one. It also performs superbly at apertures throughout - Ive been pleased with images shot from f/2.8 through f/16. Im one of those who feel that 35mm is closer to what I see than 50mm - and I love the RF35 for its light-weight, unobtrusive characteristics. But this 50mm gem is just a great lens for someone who wants a walk around focal length that can also hold its own when it comes to portraiture. It is fast to focus, quiet, renders beautiful color, saturation, detail and bokeh. Yes, it is somewhat heavy, but it didnt bother me to carry it during a four hour event (part of which was shared with its 24-105mm sibling). For the image quality that this glass delivers, the weight is appropriate and the balance on the EOS-R is a pleasure. Recommended. Rated 5 out of 5 by Oleg from The best 50 on the market Im not a huge 50mil fan but couldnt pass this one. Rented it for a week and had quite an adventure! The lens is superb optically except its 1 stop darker in the corners compared to the old 50/1.2 EF. Is it bad or not? Well, if you like vignetting - it saves 10 to 30 seconds you usually spend adding it in post. If you dont like vignetting - it will add the same 10 to 30 seconds to remove it in post. As simple as that :) The sharpness is mind blowing wide open, unlike the old 50 which becomes acceptably sharp at f/2.8. No visible CA. Great resistance to lens flare. Pretty much everything you would expect from an Otus grade lens for about twice cheaper + fast and accurate AF as a bonus. No prob tracking and taking sharp pictures of kids running in random directions. Sharpness, AF, blah blah blah... All this stuff is just another bonus to the primary characteristic of this lens which is BOKEH. Its definitely there. Any kind of background is not an issue for this lens. You can take beautiful portraits on the city dump! After Canons claim about EOS R ability to AF at EV-6 with this particular lens I was curious to see what does it mean... Tried to AF in a very dark room, and the AF relaibly worked down to 0.6s ISO 12800 with this lens. Which is ~EV-6 indeed and I think its crazy. Just to give an idea how dark the EV-6 is: if you take a regular 1.4 lens and set your camera to ISO 100 - you will need to wait 128 seconds to get the same level of exposure. PS: The control ring is a nice add-on. I set it to exposure compensation. Rated 5 out of 5 by Howard R from Fantastic! Big and heavy yes, but big and heavy on performance. Excellent color and resolution. Amazing detail low light capabilities are outstanding. Expensive yes,you get performance for your money. Fantastic! Rated 5 out of 5 by Timothy from Wow! Fantastic lens. I have 7 cannon L’s and this lens is a stunner for focus accuracy and image quality. Fun stuff! Rated 3 out of 5 by Corey from Heavy Vignetting under f2 This lens is very sharp and controls distortion well, and focuses much faster and in much less light than the EF 50L, but for what it costs, you would expect flawless performance. There is very heavy vignetting at f1.2 and f1.4, and can even be seen at f2. Buying Cine Lenses for Canon. Does this lens have a long focus throw? Does this lens have smooth F/T Stop transition, instead of &quot;click&quot; stops? For smooth transition of focus and depth of field? Does purchase include hood &amp; bag? No Canon hood or bag listed in accessories. Is there an adapter for EF bodies or is it impossible because of the flange distance? Do you need adapter for 1DX Mark 1? Agreed, the EF lenses can mount on RF, but not the other way around. Is the focus wheel focus by wire? Or geared?